The Mining Workforce Planning Scan is a mixed quantitative/qualitative report card built from relevant online industry magazines and media sources. Utilising 14 data items (expressed as categories) the scan collates relevant stories over a period of time (in this case a calendar month) to give a picture of how Australian MINING is positioned from a workforce planning perspective. With the Australian election now over there has been a return to confidence in the mining sector not seen since June 2012 when more than eight months of positive, or at least neutral employment sentiment were recorded (my analysis currently only goes back to November 2011). In terms of the mining workforce planning scan the trend is confirmed when the employment sentiment is consistently zero or above (see Chart 2) AND the employment category number is below Work Health & Safety (WH&S) or as the market tightens Industrial Relations (IR) (see Chart 1). We are not quite there as there is still some delayed cost cutting going on along with new ventures being announced. Learning & Development & Research & Development (L&D/R&D) recently spiked during the August month on the back of a lot of election chatter around mining skills as an answer to other slowing sectors (see Chart 1 & 2). This has returned to a more normalised value during September but was an interesting outcome from the 7 September Commonwealth election. Employment numbers were strong but it should be noted that many of the announcements made were actually on the infrastructure side making up 6,270 (or 87%) of the total monthly employee gains reported and most of those were actually detailing the tier 1 or tier 2 arrangements for iron projects in Western Australia or LNG projects in the Surat Basin, Queensland (see Chart 3). The following chart is an 18-month look at 14 mining related workforce planning data items (expressed as categories) and the frequency of stories. 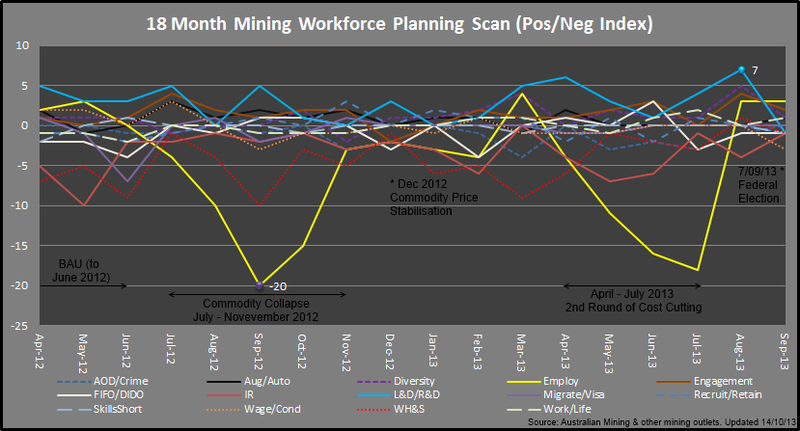 The next chart is an 18-month look at 14 mining related workforce planning data items (expressed as categories) and their positive or negative weighting. The following table looks at the reported employment gains and losses. Job losses are actuals as reported by mining industry sources but often do not reflect the total loss of employment as some companies chose to limit information relating to redundancies. Employment gains are forecast and include infrastructure phases. Often employment gains are overstated as they link to public relations exercises. I see another month of transition data coming in as some companies continue to tidy up their less difficult workforce development areas (contractors, costs and corporate), some companies move beyond the low hanging fruit to address more difficult components of their strategic workforce planning and a number of companies launch greenfields proposals. Interestingly, I also see the commencement of a new phase of Industrial Relations activity as commodity prices solidify and productivity ramps up. 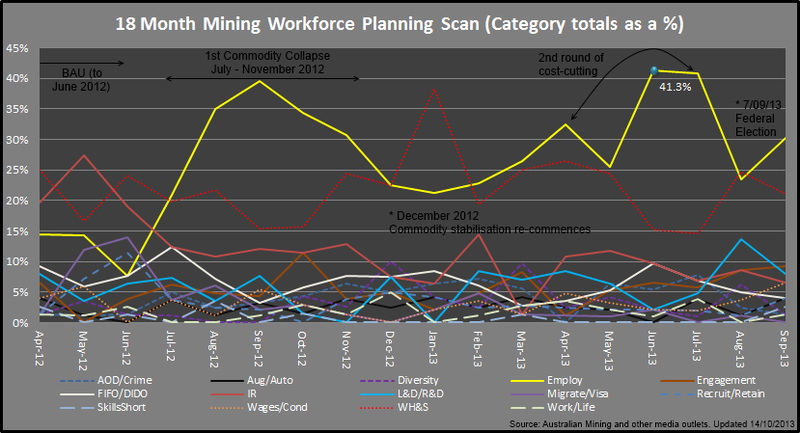 Note: My previous Mining Workforce Planning Scan can be found at Random Analytics: Mining Workforce Planning Scan (August 2013). If you are interested in “How does the global economy work in a world of reducing ‘work’” then please check out my other blog PeakJobs.